You’ll be impressed with the huge range of used Volkswagens on offer here at RAC Cars. This reputable and well-known car manufacturer produces some of the most-loved cars that we see on our roads today. The sturdy and reliable models have plenty of choice for those looking for an affordable used car. They never claim to be a prestigious brand; however, you can rely on Volkswagen to deliver exactly what you need, because of their transparency and their determination to leave the pompousness off the road. With everything from little city runners to practical people carriers, there is a car to suit everyone in our collection of used Volkswagens for sale. One of the newer, popular makes from VW is the VW Up! This small hatchback has been named as the 2017 Auto Express “City Car of the Year”. A popular choice because of its nimble design and low Co2 emissions. At the same awards, the VW Golf bagged “Compact Family Car of the Year”. 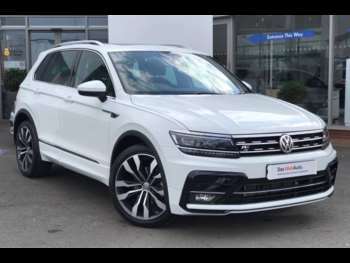 Another popular make is the VW Tiguan, which is great value for money and perfect for those looking for a larger SUV style vehicle. With 5 doors and 5 seats, this car is incredibly spacious and comes with a chunky, well-built exterior. Other popular makes include the Polo, Passat, Beetle, Touran, and the Phaeton. Volkswagen means “car of the people” in German and believe it or not, the first VW Beetle was designed by the person who would later become the founder of Porsche. They home in on innovative technology that looks to create cars for the future, making them a fantastic choice for used car hunters. Volkswagen became the official UK importer in 1953 and centralised its operations in 1978, moving its headquarters to Blacklands, Milton Keynes. Got a specific Volkswagen model in mind?